Do you ever feel that you don’t want to socialize at all? I don’t mean the internet or media kind of socializing but actually going out there and meeting people? Do you feel going out when you know you’re going to meet a certain group of people that you’re comfortable with rather than one that you’re not comfortable with? Confused??? Well, I know I should be putting on my saris and going out for garbas to my community hall but I just don’t feel like going. My hubby thinks that I’m still missing my family and that’s why I don’t go. If its my Lions Club meeting I want to go. Does that make me a less responsible person towards my community? I don’t have answers for all that. Its at times like these I miss my family so much. Hubby and I are the only ones here in Mombasa. Some family from both sides lives in Nairobi, the rest are spread over UK, US, Canada, India and Bali. Yes, Bali, my eldest son and daughter in law are planning to settle in Bali. So hubby is always joking that they are Bali sana… in Kiswahili bali means far and sana means a lot …so basically they are too far! Festivals without family are not as nice or appealing. Hopefully by tomorrow I’ll feel different and go at least once for the garbas. Today’s recipe is a salad. I initially wanted to make spring rolls with the rice paper… the see through kind. Don’t they look so pretty with colorful veggies in them. I had the other ingredients ready at home but couldn’t find the rice paper in the nearby supermarkets in Montreal. I was going to mix everything and prepare the salad without the rice paper 🙁 Got home and remembered that the half used phyllo pastry was still in the fridge and would dry up if I didn’t use it. If I waited to get the rice paper, the bean sprouts would turn brown. And there appeared an idea… phyllo cups for the salad. Baking Spanakopita can wait till the next trip. So do feel free to use the rice paper if you want. However, this phyllo cups with salad were so so yummy and refreshing. Great party recipe as you can bake the cups ahead. By no means am I claiming or supporting any sort of fad diet that are the latest craze in the fitness world. I’m just trying to include non meat non fish dishes from which you can get your protein source. Grease a muffin tray lightly with some oil. Cut the phyllo pastry into squares (5 layers together) about 4″X4″. Place each square into the muffin cups, and fold and adjust them so they fit well in each cup. Bake for 15 minutes or till the cups begin to turn light brown. Take the phyllo cups out of the muffin tray gently and let them cool on a wire rack. Mix all the ingredients in a bowl or jar. Adjust the taste according to your liking. Mix the bean sprouts, enoki mushrooms, spring onion and shredded carrot in a bowl. Very gently fill the cups with the salad. Top it with the dressing and serve. I used ready made bean sprouts but you may use home sprouted beans. Steam them slightly or leave them raw. Add vegetables of your choice to make the salad. I leave the dressing a bit thick so that the cups don’t become soggy. 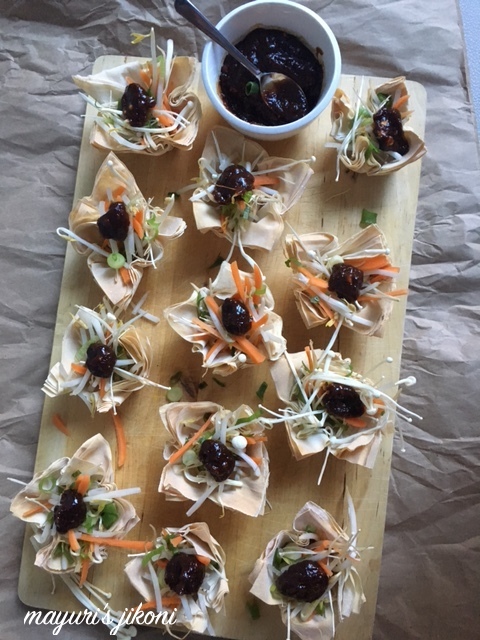 Use ready made phyllo cups if you get them or alternately use rice paper. Don’t bake the rice paper. Bean sprouts are my favourite protein rich ingredient. I like how you used them into the phyllo cups. Am sure this phyllo cup salad is definitely a crowd pleaser, thats a creative idea to make phyllo sheet as cup to serve salad, good job. Hi Mayuri, these phyllo cups are cute, I want to taste this healthy bite now. Phyllo cup salad looks so cute.. Perfect for healthy kids snacking!! This is such a cute way of serving salads. Love the peanut sauce on top and the phyllo cups so much.. Your cup salads would make a great party starter for sure as well!..I guess having relatives across the globe is fun and taxing at the same time…. I know it's tough Mayuri when the family is not around, especially during festivals. But dress up and go to the local festivities….will be a good change of mood for you. That's a clever idea for a filling salad. Love the peanut dressing too! Bookmarking it! Festivals are meant to be shared with family. So its is natural with the way your family is spread you will not want to go anywhere. Take heart dear. Love the peanut butter dressing and like I said the pictures tho are drool…. Loved the dressing on these salad bites. Perfect for parties.